Located some 30 minutes from Danang International airport, Vinh hung 2 Hotel is your ultimate choice while visiting the charming 15th century town of Hoian. 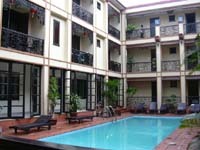 Situated in the center of Hoian Ancient Town, Vinh hung II hotel is an ideal place for visiting and relaxing. All the rooms of Vinh Hung 2 Hotel Hoi An have recently been renovated and are decorated in old Chinese design and have wooden floors which create a special traditional atmosphere. The hotel offers Standard rooms and Suite rooms which are both completely refurbished, equipped with the latest facilities and double glass windows to keep out any noise from outside. - Standard Rooms: 30 square meter modernly equipped rooms with shower with bathtub and a balcony which offers a beautiful view on Hoi An town. The restaurant serve in the best local Vietnamese Cuisine. We pride ourselves not just on quality of our food and service, but on the enjoyement of the dining experience as well. Copyright © 2003 - 2012 Vietnam Hotels and Reservation Vietnamhotels.biz .